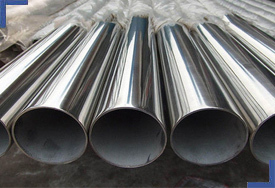 2205 Duplex Stainless Steel Welded Pipe, Duplex Steel UNS S32205 Pipes, Duplex Steel DIN 1.4462 Welded Pipes, Duplex Steel S32205 Welded Pipe, ASTM A790 Duplex Steel S32205 Pipes, SAF 2205 Welded Pipe, UNS S32205 Welded Pipe, Duplex 2205 Welded Pipes, Duplex Steel S32205 Pipes Manufacturer in India. MBM Tubes is a Mumbai based manufacturer and trader of Duplex Steel UNS 32205 Seamless Tubes. Our products are known for their robust built and durability in all conditions. Our Duplex 2205Welded Pipes are more readily available as compared to Seamless Pipes. Our Duplex Pipes are more consistent in thickness and surface finishing unlike Seamless Pipes. These Pipes are well checked for internal surface finishing. These Welded Pipes can withstand crevice, intergranular and pitting corrosion well. Our Welded Pipes can resist Chloride Stress Corrosion Cracking. Our products are offered in customizable sizes, thickness and finishing as per customer requirements. Our products are built to meet international standards of production and safety. We deliver products in robust built and precise finishing, which ensures their usability in all conditions. Duplex Steel 32205 Welded Pipe, Duplex Steel UNS S32205 Welded Pipe, Ferritic/Austenitic Duplex Stainless Steel S32205 Welded Pipe, Duplex Steel 2205 Welded Pipes, ASME SA790 Duplex Steel 32205 Welded Pipe, A790 Welded Pipes, UNS S32205 Welded Pipe, Duplex Stainless Steel UNS S32205 Pipe, 2205 Duplex Pipe Supplier in Mumbai, India. Howrah, Vadodara, Haryana, Aberdeen, Visakhapatnam, Dammam, Mexico City, Los Angeles, Bogota, Jamshedpur, Kolkata, Milan, Perth, Abu Dhabi, Edmonton, Gurgaon, New Delhi, Ulsan, Muscat, Noida, Indore, Bangkok, Brisbane, Santiago, Ho Chi Minh City, Moscow, Ahvaz, Nagpur, Jaipur, Hong Kong, Kuala Lumpur, Sydney, Caracas, Calgary, Secunderabad, Karachi, Algiers, Navi Mumbai, Thane, Al Khobar, Chiyoda, Surat, Coimbatore, Faridabad, Jeddah, Ernakulam, Atyrau, Rajkot, Nashik, Hyderabad, Lahore, Pimpri-Chinchwad, Ranchi, London, Madrid, Kuwait City, Montreal, Busan, Granada, Manama, Cairo, Ahmedabad, Houston, Pune, Port-of-Spain, Singapore, Vung Tau, Dubai, Ankara, Ludhiana, Tehran, Al Jubail, Gimhae-si, Petaling Jaya, Lagos, Jakarta, Sharjah, Courbevoie, Bhopal, Istanbul, Hanoi, Seoul, La Victoria, Dallas, Doha, Chandigarh, Chennai, New York, Baroda, Kanpur, Thiruvananthapuram, Rio de Janeiro, Geoje-si, Toronto, Melbourne, Bengaluru, Riyadh, Mumbai, Colombo. South Africa, South Korea, Kazakhstan, Peru, Puerto Rico, Netherlands, Ghana, Portugal, Ecuador, China, Austria, Gambia, Tibet, Libya, France, Egypt, Finland, India, Mexico, Jordan, Lebanon, United Arab Emirates, Canada, Oman, Sri Lanka, Chile, Kenya, Bolivia, Venezuela, Argentina, Bangladesh, Australia, Ukraine, Gabon, Estonia, Nigeria, Afghanistan, Mongolia, Yemen, Singapore, Iran, Angola, Iraq, Morocco, Spain, Croatia, Malaysia, Italy, Taiwan, Indonesia, Pakistan, Poland, Vietnam, Kuwait, Belgium, Denmark, Costa Rica, Greece, Russia, Algeria, Nigeria, Mexico, Bhutan, Colombia, Sweden, Azerbaijan, Philippines, Iran, Japan, New Zealand, Macau, United Kingdom, Chile, Nepal, Belarus, Brazil, Hungary, United States, Turkey, Poland, Trinidad & Tobago,Tunisia, Bahrain, Serbia, Saudi Arabia, Romania, Germany, Zimbabwe, Israel, Norway, Thailand, Ireland, Switzerland, Slovakia, Bulgaria, Hong Kong, Czech Republic, Qatar, Lithuania, Namibia.